Amanda Jordyn Designs | A stylish accessory, displaying Picture Alternatives logo in natural stone. 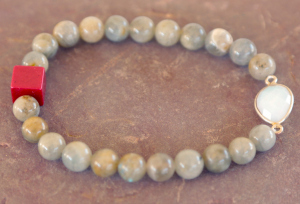 Gray larvikite stone bracelet with red cube connector. Bracelets designed and made in Southern California by Amanda, age 14, and Jordyn, age 12, and their moms, Jacqueline and Rachel.